Tampa is blessed with amazing weather year round, and with plenty of sunshine on most days. You don't have to pack the car and drive to the beach to enjoy the weather with so much outdoor recreation in Tampa right in our backyards! If you want to enjoy the day on a budget, plan to spend some time at one of our beautiful public parks in Tampa. Here are some of the Tampa parks with playgrounds that are perfect for families. Located in Downtown Tampa, the Curtis Hixon Waterfront Park overlooks the Hillsborough River with a sloping lawn featuring two fountains, a children's playground, public boat docks, a dog park and convenient to other attractions in Tampa including the Glazer Children's Museum. Water Works Park is a City of Tampa park located off Tampa Street just north of Downtown Tampa. Located on the Hillsborough River and part of Tampa's Riverwalk, there are trees for shade along with a splash pad, grassy lawn and a striking view of Tampa's skyline. Al Lopez Park is a 126-acre city park in Tampa, offering several recreation activities including hiking trails, fishing and wildlife viewing. Al Lopez Park also has plenty of shaded areas and shelters you can reserve for parties, and boasts to one of the most popular playgrounds in Tampa. 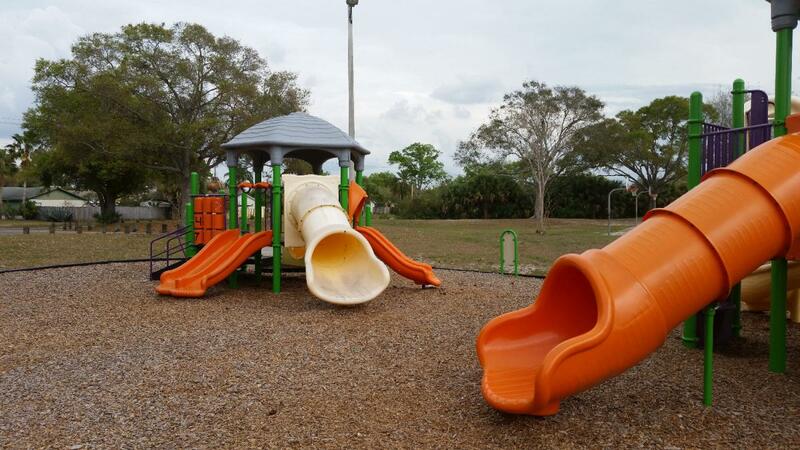 Macfarlane Park is a city park in the West Tampa area with many park amenities including picnic tables, grills, restrooms, ball fields, play courts, tennis and racquetball courts, and a playground your children will remember! Tucked away near the Westshore District, this hidden treasure is a City of Tampa park that includes a playground, picnic benches, pavilions, bicycle racks, canoe launch, walking trails, ample parking and a beach! It's perfect for both your kids and your pets, and offers a gorgeous view of the sunsets over Tampa Bay. Enjoy a day of outdoor fun at this beautiful city park in tony Hyde Park. Amenities include grills, playground, picnic areas, as well as some basketball courts where the little ones can even find some friends to play some hoops! There are also gates on all sides so you can an eye on your kids while sitting one of the many benches for the parents. The park features a beach, canoe & boat launch, picnic areas, a pier, grills, playground, shelters that can be rented for private gatherings, a dog park & much more. There's also the bonus of a great view of Tampa Bay, as you can take an entire day here with fun for the entire family! A neighborhood park in South Tampa near the southern tip of Bayshore Boulevard, there are walkways along the water, shaded areas, picnic shelters, a children's play area, restaurant and even a fishing pier for wonderful day outdoors. Rumors of some delicous stone crab in this area well. Ballast Point Park is also home to one of the biggest playgrounds in Tampa along with a splash pad to cool off on those super-hot summer days. Community park in the Boyette area with a playground, covered picnic area, basketball courts, baseball field, and a small walking trail. Need some playgrounds in Tampa where you can spend a whole day? Lithia Springs County Park has so much to offer. It's a beautiful slice of nature in the Brandon and SouthShore area, and the highlight is the crystal clear, natural spring. Other features include camping, canoeing, and much more. There is a small entrance fee to enter the park. One of the largest recreational facilities in the SouthShore area of Hillsborough County, Apollo Beach Park & Recreation Center has plenty of amenities and activities. There are tennis courts, of course a playground, a fitness center, open fields and more. The kids can enjoy the playground while the parents can take tennis lessons or a workout class. Outdoor activities aplenty when you visit the Welsey Chapel District Park. You'll find a walking trail, playground, fishing, basketball courts and even shelters to rent for groups that are gathering. Lettuce Lake is a great Tampa park perfect for canoeing, picnics, hiking and much more. And if you're a student or staff member at USF, you can even rent canoes, kayaks, or even some meeting shelters for free! Stop by and see why it's one of the best spots for recreation in Tampa, and enjoy a relaxing day outdoors. There are several county and city parks in Tampa with playgrounds and other amenities to enjoy the outdoors. Use 813area.com to help discover more places and things to do in Tampa. Have a favorite place you want to see featured? Be sure to contact us and let us know!